Fast Charger: full charged one plus battery is about 30 - 50 minutes base on capacity. LED temperature gauge lighting, also Indicator lights that show the status as batteries are charged and maintained. Charger has patented IntelliPort Technology, which protects battery cells, maximizes battery life, and conserves energy so well it earned an energy star rating. 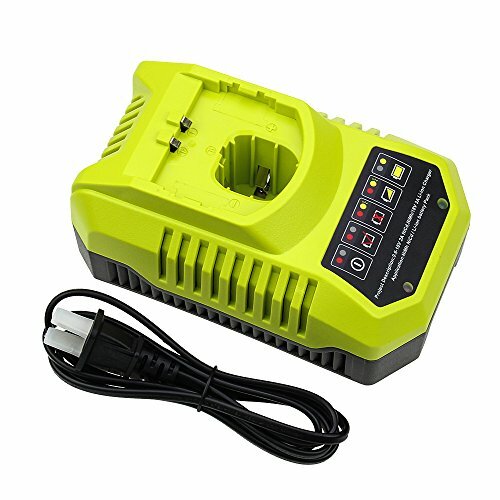 Replacement ryobi P117 P118 charger perfectly fit for ryobi 18v, 14.4v 9.6v battery, it can charge P100, P101, P102, P103, P104, P105, P106, P107 and P108 Ni-Cad & Lithium-ion Battery. ensure a full charge and battery protection.Built-in protection against potential damage caused by overcharging, overheating and short-circuit protection. All of the products are CE FCC,ROHS certified, tested by manufacturer to match OEM products and exported all around the world.Longer Lasting&Battery Safety. GERIT BATT 30 days money back and 1 year manufacturer warranty guarantee. If you have any questions about this product by GERIT BATT, contact us by completing and submitting the form below. If you are looking for a specif part number, please include it with your message.